A senior nuclear power exec claimed at a recent seminar in London that the environmental footprint of a US nuclear power station was 100 times smaller than an onshore windfarm. (no sizes given unfortunately). AWEA Director and wind expert Tom Gray says "my rule of thumb is 60 acres per megawatt (MW) for wind farms on land". According to the Energy Information Administration, The Fort Calhoun 476 MW nuclear power plant, operational since August 9, 1973, is located on 660 acres near Omaha, Nebraska and has an easement for another 580 acres, the acreage being maintained in a natural state. So on the face of it, on the same 1200+ acres, nuclear gets 480 MW versus 20 MWs for wind, or 40 times more. But the capacity factor for the nuclear plant hovers above 80% and wind is approximately 30%, so clearly the 100 times more claim seems to be 'on the mark' if you chose to forget the nuclear fuel cycle. We now have active farming on-sites of large wind farms, and there is no reason to believe we could not also harvest crops between the large wind generators for biomass electric power, which could increase electrical output of the same acreage substantially. * processing of the resulting waste during the life of the generation plant. Mining uranium takes lots of land. Uranium is widely distributed in the earth's crust but only in minute quantities, with the exception of a few places where it has accumulated in concentrations rich enough to be economically mined as an ore. The main deposits of ore, in order of size, are in Australia, Kazakhstan, Canada, South Africa, Namibia, Brazil, the Russian Federation, the USA, and Uzbekistan. Storing nuclear wastes also takes lots of land. According to the Environmental Protection Agency, in 2000, the USA had approximately 600,000 cubic meters of different types of radioactive waste which were generated, and approximately 700,000 cubic meters were in storage awaiting disposal. Radioactive wastes in the form of spent nuclear fuel (2,467 metric tons of heavy metal) and high-level waste "glass logs" (1,201 canisters of vitrified high-level waste) are in storage awaiting long-term disposal. In 2003, The Energy Department has asked permission to reserve use of 308,600 acres of public land across rural Nevada to develop a railroad corridor to the proposed nuclear waste repository at Yucca Mountain, located in Nye County, has a land area of 11,560,960 acres, Nye County is larger than the total acreage of Massachusetts, Rhode Island, New Jersey, and Delaware. Of this vast land area, only 822,711 acres (or just over seven percent of the total) is private land; the majority of the county's land is owned by the federal government. Add potential land loss to human and technical error, harsh weather and earthquakes, and potentially, to terrorism, the land issue becomes the least of the differentiations between the technologies. 1.3 million cubic meters of nuclear waste (or anything else for that matter) could be contained in a cube 110 meters per side. Or in other words the size of the basement of an office building. This is bigger than a breadbox but doesn't seem to be big when compared to a wind farm. This is a thoughtful article covering some of the issues surrounding alternatives to CO2-generating energy supplies. Those of us in the bulk generation field (nuclear for me) are often frustrated with the perception that a few windmills can replace a large generating station. One comment on your details: all land is not considered equal, of course. I suspect the Nevada land in question is stark desert or at best marginal grazing land, and not prime farmland. This doesn't mean it doesn't have natural value (I find deserts fascinating) but that should be taken into account. Many nuclear sites in the US sit on sizeable acreages because there initially were plans for immediate explansion (and new plants may still be built there.) Also, it simplifies evacuation plants. Now the extra land serves as a security buffer. Little of it is actually used, so it is somewhat of a nature preserve. 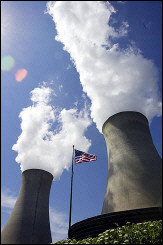 If you would like a way to get an inside portrait of the US nuclear energy industry without much effort, see my site RadDecision.blogspot.com for a novel on the topic. Its been endorsed by Stewart Brand, longtime enviornmentalist and founder of The Whole Earth Catalog. There's no cost to readers.